B$RN How Is Your Hotel Bar Doing? - Strategic Beverage Solutions Inc.
Well now there is a way. Strategic Beverage Solutions Inc. has engaged with over a thousand hotels in understanding their bar performance position. That’s a lot of data combined with a lot of observation and specific understanding of property situations. Along the way we developed a way to universally evaluate how well a venue is doing relative to its opportunity. 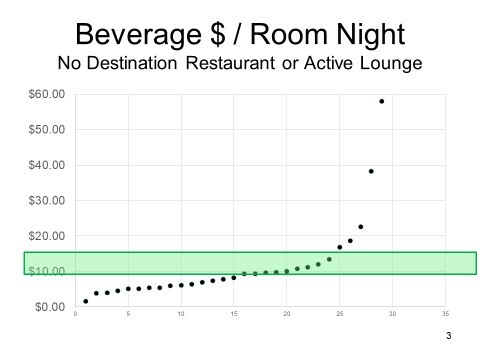 Venue Beverage Revenues per Room Night (B$RN) answers the question – how well does our hotel bar/restaurant attract end of business day hotel and group guests? 95+% of your alcoholic beverage revenue in a venue comes in post 4pm, so it truly isolates how you are doing in terms of attracting post 4pm hotel and group guests into your venue. 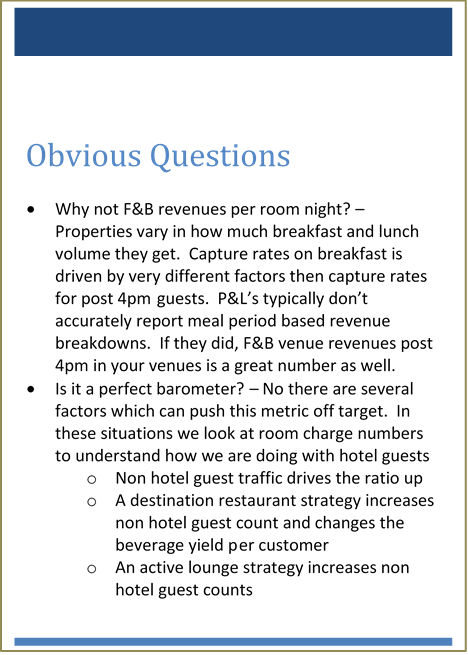 If there are situation variables that can artificially effect the metric, there are secondary ways to answer the question in those situations – are we successfully attracting F&B contribution from our hotel and group guests after 4pm? The charts represent a sample of 50 hotels and how they scored in their B$RN. A good B$RN is calculated to be $10-$15. (see www.Is-Your-Hotel-Bar-Underperforming?.com) This means you are effectively getting one alcoholic beverage sale for every occupied room per night. The average number of drinks consumed by an end of business day venue guest is 2.7. 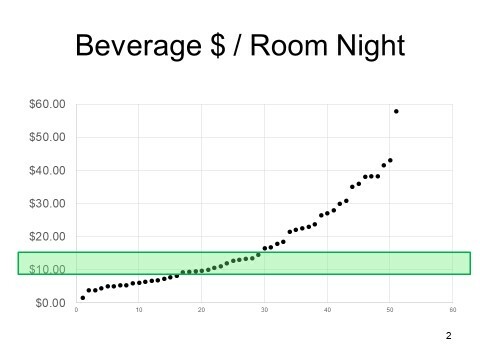 So another way to look at the target B$RN is that you are getting one out of three hotel room guests into your bar per evening. The highest performing hotel was an extended hangout customer venue. The $57 B$RN rating was driven by end of business day non hotel guests who also flocked into the venue. The impact of getting all of the hotels below the standard (20 hotels) up to the standard would yield $15M in incremental beverage revenue and a projected $25M in total F&B revenues. The average number of rooms in these hotels was 462. Only 47 more customers in the bar per day at each hotel to hit that target. 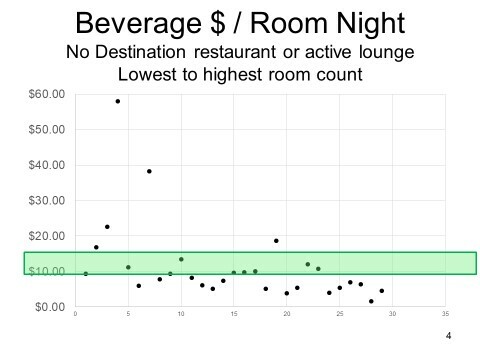 The positive impact on B$RN of destination restaurant and active lounge concepts was clear, but in actuality most of those hotels did worse than their peers in terms of hotel guest traffic. 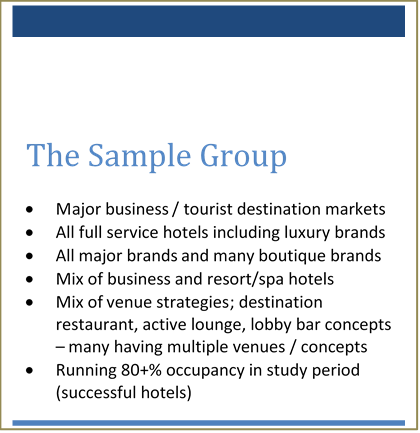 More than 50% of the lobby bar only sample group did not hit the minimum standard. There was no correlation between room count and B$RN. Size of hotel does not influence the ratio.